It is rewarding to treat not only my patients, but also their continuing generations. Dr. Walling is board certified by the American Board of Orthopaedic Surgery and fellowship trained in foot and ankle surgery as well as musculoskeletal oncology. He was director of the Orthopaedic Residency training program at the University of South Florida and Full Professor until 1989 when he became a founding member of Florida Orthopaedic Institute. Dr. Walling received his medical education at Creighton University in Omaha, Nebraska and completed his residency in orthopaedic surgery at the University of South Florida. He completed a fellowship in musculoskeletal pathology at the University of Florida and a preceptorship in foot and ankle surgery in California. Dr. Walling serves as the Director of the Foot and Ankle Surgery Fellowship Program at Tampa General Hospital. Dr. Walling has presented lectures and research at more than 100 national and international meetings and educational forums. He has been Chairman of the AO North America Foot and Ankle Courses since 1999. He has published numerous articles, book chapters and abstracts and has been the recipient of the American Orthopaedic Foot and Ankle Society, Roger A Mann, M.D. Award for outstanding clinical study on two occasions. He is an original member of the FDA study on the S.T.A.R. total ankle replacement, and continues to be active in numerous ongoing research projects. He served as an original Cancer Committee member of The H. Lee Moffitt Cancer Center and Research Institute and Sarcoma Program Leader. 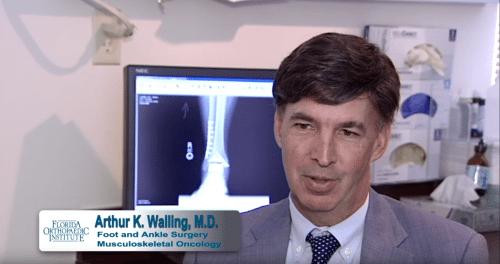 Dr. Walling is a fellow in the American Academy of Orthopaedic Surgeons and a member of the American Orthopaedic Association, Association of Bone and Joint Surgeons, and the American Orthopaedic Foot and Ankle Society. He has been a member of the AAOS Education Committee and has written for both the Orthopaedic in-training examinations as well as the ABOS board certification exams. He is currently Chairman of the AAOS Foot and Ankle Evaluation Subcommittee. I just want to thank you for saving my arm and, most likely, my life. 20 years ago, I was diagnosed with Osteosarcoma. You saved my arm and I thank you from the bottom of my heart. I have had 20 years as an RN/Lactation consultant and I am now retired. I have a grandchild and a wonderful and blessed life. Thank you for your work and dedication. I have just met the nicest, most knowledgeable foot and ankle doctor ever. Dr. Walling and staff are not only compassionate and funny but so nice! I love Florida Orthopaedic Institute. Thank you for all you do! I just wanted to say that Dr. Walling did a wonderful job on my ankle. But I really wanted to give credit to his secretary Ann Marie. The process of replacing my ligaments was a long tedious and confusing one. All the medical procedures, terms and in general the whole process could be very confusing. But I always knew that if I called Ann Marie that everything would be OK. She was always kind, courteous, informative, and always returned my calls in a timely fashion. She made the whole process much more palatable as it was a very trying time for me. I always knew she would be there for me. I cannot tell you how important that was to me and should be to your whole practice. Thank you Dr Walling and thank you Anne Marie. I found Dr. Walling to be very professional, knowledgeable, and extremely competent. Should I ever decide to proceed with foot surgery, he would be the surgeon to perform it. When I arrived at Dr. Walling’s office, I had over 7 surgeries on my left ankle and it still wasn’t working correctly. Pain was a constant reminder of the initial accident (falling down a wheelchair ramp), and if I did too much, I was literally down off my ankle for at least one day. After meeting with Dr. Walling, getting a new MRI done and another office visit, it was determined I needed an ankle fusion. Things just weren’t working right and the pain was going to get a lot worse. I liked Dr. Walling’s no non-sense approach and I knew he would not operate if it was not necessary. After the surgery, I cried and I cried because the pain was over the top, but Dr. Walling and his Associates assured me that all went well and I would soon recover. Over the next 6 months, as I healed and learned to function a different way, the staff helped this process so much. I even teased Dr. Walling about his bedside manner (matter of fact), I loved his dry sense of humor. Recently, I had to go see Dr. Walling about my right ankle because I had fractured it. I would see anyone other than Dr. Walling. Once you have been treated by the best you simply don’t see anyone else. Thanks FOI, Dr. Walling and staff. I am a patient for life. I am alive and active because of Dr. Walling. In 1987, at the rambunctious and invincible age of 14, I was diagnosed with osteosarcoma (bone cancer) of my tibia (lower leg bone) and I have been his patient ever since. I was not the most compliant patient; In fact, I was probably one of the most misbehaved to say the least. All the while, Dr. Walling handled me with genuine care, honesty, and compassion regardless of my antics. Dr. Walling & Dr. Bernasek did a total knee replacement with a tibia cadaver replacement one week after I turned 18. Now, I am a 40 year old registered nurse working in oncology in St. Petersburg, Florida and I am still walking on the same total knee and cadaver bone Dr. Walling and Dr. Bernasek did for me 23 years ago. Yes, 23 YEARS! Dr. Walling, to this day, has been the most frank and honest doctor I have ever known personally and professionally. I am privileged to be his patient! I am a new patient who in 2 visits has experienced wonderful results in my journey to wellness. Through some unique treatments I have gotten back feeling & reflex in the foot, ankle and other joints. I can do some walking now and have reduced pain in arthritic ankle. While I have a way to go, in 2 visits he accomplished much more than I have received from other physicians over 10 years. I look forward to what is in store for me next.